The Verona Pedestal Dining Table features an intricately handcrafted pedestal base, and a solid 1" thick top thickness for strength and durability. The style and elegance of the pedestal base is simply undeniable! The Verona Pedestal Dining Table is constructed from only the highest quality, locally grown, American hardwoods. Coupled with expert Amish hand-craftsmanship, this table is of heirloom quality and is designed to endure a lifetime. Integrity of workmanship provides peace of mind. Our skilled Amish craftsmen take great care in producing furniture with value and lifetime quality. The Amish Verona Pedestal Dining Table comes with a lifetime warranty! Pair this single pedestal table with our Verona Dining Room Chairs. Choose from 8 beautiful solid hardwoods, 5 sizes, and a wide variety of finishes. Custom size dining room tables and kitchen tables are available upon request. Additionally, Amish craftsmen possess a unique and unrivaled understanding of wood grain. Grain matching the table's skirting accentuates the true beauty, overall unity, and fine craftsmanship of the finished piece. The table feet have recessed adjustable levelers. 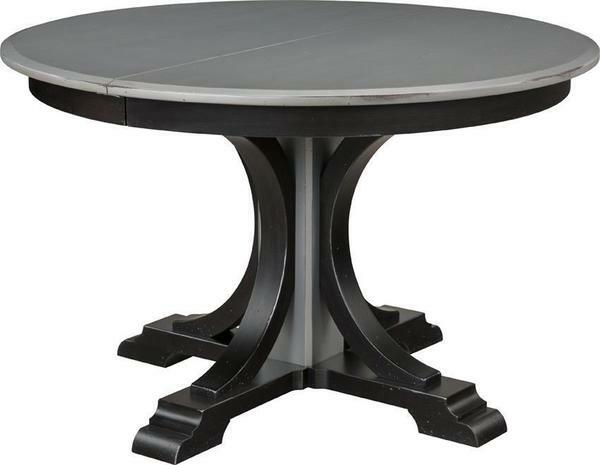 This striking pedestal dining room table will serve you and your family for years. This American made dining room table comes with the peace of mind that a lifetime warranty offers! Please call one of our furniture specialists today to receive finish samples to help you decide on the stain, paint or finish package. Floor to Skirt Clearance: 26-3/4"
Third Leaf is Only Available on 42" - 48" Sizes Not Available on the 54" and 60"
If Elm/Clear Maple – S wood option selected, Elm wood will appear on table top only.